Relax and unwind while you step back into Victorian times at Antoinette’s Apartments & Suites in Cape May, NJ. Discover the romance of a Cape May vacation. Your cares will begin to evaporate as soon as you enter the charming interior of this friendly Inn. Antoinette's will make you feel right at home. Our large, spacious 1 bedroom Victorian Suite is perfect for couples, yet accommodates up to 6 people. Children are always welcome at Antoinette's Apartments & Suites. 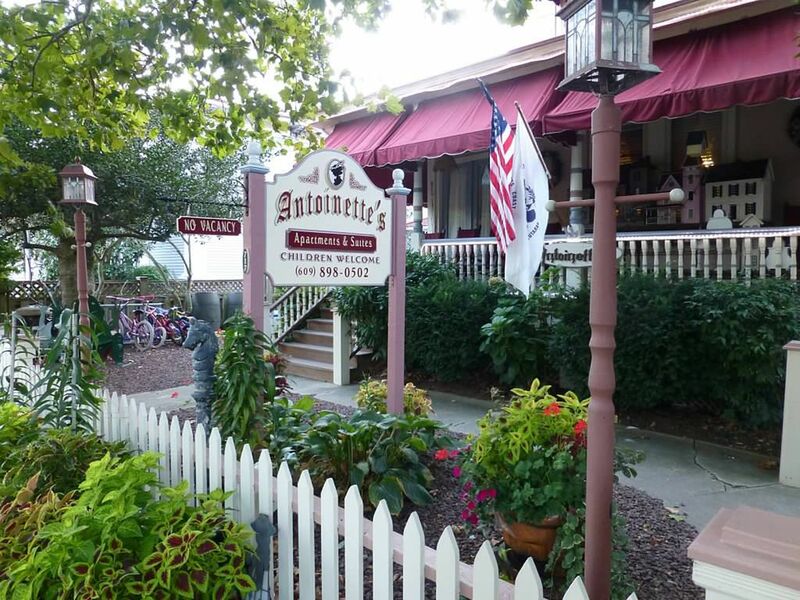 Antoinette’s is located is in the heart of the Cape May Historic District, steps from the Washington Mall, fine dining and shopping. Just a short walk will take you to our boardwalk and world class beach. Just park your car once and enjoy walking throughout the tree lined streets of Cape May, a National Historic Landmark City. The Lucia Suite (#3) has become the favorite for honeymooners and couples. The highlight of the Suite is the queen size canopy bed with lace from London decorating this attractive bedroom. The Lucia suite has been tastefully decorated with antique and contemporary furniture, handmade curtains, drapes and Victorian lampshades. This charming and romantic 1 bedroom suite is located on the second floor overlooking Washington Street and can accommodate up to six people. Enjoy the view of the magnificent architecture of the Southern Mansion as the clip clop of the horse and carriages lulls you to sleep. If you'd like to view one of our larger suites, check out VRBO#364013. -A combination living room and dining area with one Queen size sofa bed, color cable TV, VCR/DVD, antique oak dining room set with hand made Victorian lampshades, and walnut gas log fireplace with remote control. -Private fully equipped kitchen with gas stove, microwave, toaster oven, coffee pot, refrigerator and extra deep kitchen sink. -Master bedroom with a queen size canopy bed decorated with hand made lace from London, wicker twin size daybed with twin trundle below, TV and charming bay window overlooking downtown. -Two room air conditioners in both bedroom and living room. -Ceiling fans in bedroom and living/dining room. -Entrance to Suite is from front of house with door accessible from both LR and Bedroom. -Free street parking on Washington Street across from Antoinette's. We are a family friendly destination in Cape May close to beaches, restaurants, entertainment and shopping. bikes on premises for all ages, washer and dryer, full kitchen, extensive DVDs and board games collection. For daily only - not for weekly. Access to this in auxiliary area. For daily not for weekly. Rates for 2 persons from July 1-August 25, 2019 is Friday & Saturday is $299 per night, Sunday & Thursday $279, Monday-Wednesday $259, Summer reservations require 4 or more nights. Holidays may be higher. Daily base rate is $159 midweek and $199 on weekends during pre and post summer dates. Children under 9 free, extra person $25 per night over 8. Rates are subject to change.